Testwork on South Africa-based high-performance polymer producer Vesconite’s polymer sliding wear plates has shown promising results on a crawler drill that is employed at Vedanta zinc project, in Gamsberg, in the Northern Cape, South Africa. The wear plates were installed on the rotary head slide of a drill that carries out exploration drilling at the mine that is to exploit one of the largest zinc orebodies in the world. The rotary head moves the drill into the ground for deeper and shallower drilling. It also moves to allow the drill to be changed. Since the rotary head moves about 120 times a day, wear on the slides was considerable, and the original-equipment manufacturer’s (OEM’s) nylon wear pads only lasted 500 hrs. As a result, the OEM crawler drill supplier involved in the zinc project sought a solution to extend the life of its wear pads and investigated other more wear-resistant materials that could cope with highly-abrasive materials such as chrome and silica that come in contact with the plates. 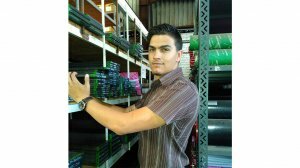 Vesconite Bearings technical representative Phillip de Villiers recommended the use of Vesconite in the application to improve the total wear life of the sliding wear plates. The OEM crawler drill supplier reports that the Vesconite polymer wear plates have lasted more than twice as long as the OEM nylon wear pads with more than 1 300 hrs of operation to date. “They will continue to be used and the wear life will be closely monitored in comparison with the nylon OEM parts,” he says. The wear life will be proved on the ten wear plate assemblies comprising 20 separate wear plates on the crawler drill. Installed in July, De Villiers mentions that the plates operate 12 to 16 hrs/d, seven days a week. The only time the crawler stops is if the mine has downtime or maintenance. Moreover, De Villiers points out that, in a separate application on the crawler drill, Vesconite wear plates have also been employed on the boom slide. This is where the rear part of the crawler drill is moved and adjusted to the drilling height, and provides stability to the drill. This boom moves roughly six times a day, so the wear is not as considerable as that on the rotary head slide. However, with the previously-installed OEM nylon slides lasting 1 000 hrs on this application, there was still a need to improve the lifespan of these slides. The OEM equipment supplier hopes that the Vesconite will last much longer than the 1 000 hrs of the OEM nylon slides. With low wear on the six Vesconite assemblies, comprising 12 wear plate halves, early indications are that the Vesconite will also perform well in this application.